On Halloween, we will begin our morning with a Halloween parade at 9:00 AM. Into the school on Halloween morning will walk Superman, a clown, an angel, some devils, the Disney princesses will be present, maybe an astronaut, a pack of Ninjas, Darth Vader, and possibly some pirates. Parade Route: Exit the main entrance doors, cross at cross-walk, have a Zombie walk around the sports park, enter the building through the doors by 4th grade, continue parade line-up down 6th grade-5th grade hall, enter the gym. Once all are assembled, we will sing a few “pumpkin carols” as a school and then return to class. PTA parties will be in the afternoon. We will parade around the halls once and then on the second trip around, classes will drop from the parade when the class nears the classroom. PLEASE NOTE: if the weather is inclement, we have very limited space in the gym. We are a school of nearly 1000 students/faculty and we fill the gym to near capacity. We discourage parents from joining us in the gym and instead find a great spot to lean against the walls and take pictures as the ghouls parade by. A Great BIG Thank You from Riverview!! Our Chalk-Walk was a huge success. We have raised $16,296.50. Money will be applied towards purchase of Chromebooks and Carts. After visiting with your child(s) teacher at SEP conferences, stop by the gym for family night! The bookfair will be open until 8:00 PM. Afterschool Session 2 will begin on Oct 29 and go through Dec. 13th. No Clubs will be held on Oct. 31 or Nov. 21, 22, 23 Monday clubs will be held 2:15-3:45, Tue.-Fri. clubs will be held 3:00-4:30. Tuesdays - 8 spots in STEM Jr. exploring Minecraft, science, and computer code for kids. Wednesdays - 4 spots in Christmas Around the World exploring traditions of other countries and a Christmas service project. Fridays - 8 spots in Adventure Kids exploring something new each week sports, art, science, music, food, crafts. October 31st – Halloween Parade at 9:00 AM; inclement weather parade start will be at 9:30 AM with the parade going through the halls. Conferences will be held Wednesday, October 24th from 3:00-5:30 & Thursday, October 25th from 3:00 - 8:30. Riverview Afterschool program is excited to announce the Winter 2018 program. Registration will be online Tuesday Oct. 23, at 8:00 a.m. www.riverview.edu under parents tab and click SIGN UP GENUIS. All information including schedules, club descriptions, registration forms, and waivers will be on the website. Every student participating must fill out a registration form and waiver. Fees for Riverview Afterschool will be $20 per club. Students may sign up for as many clubs as they would like. Fees will be paid in the office cash or check only. Students will receive healthy snacks, prevention lessons, physical activities including movement games, and one hour of instruction and activities during club time. If you would like to make payment arrangements or have any questions please contact RaeAnn Nelson at raeann.nelson@nebo.edu. For the past nine years Riverview has received federal funding. This year the only schools who received funding were Title One schools. Currently, Riverview does not qualify for any funding. 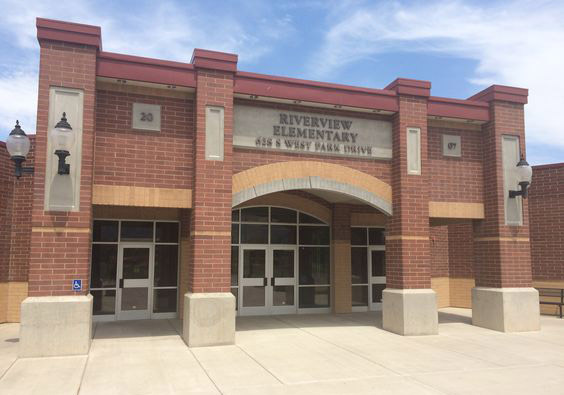 Riverview has the largest Afterschool program in the state of Utah. WE NEED YOUR HELP AND SUPPORT, we want to continue this great program. An early morning club will be available every day at no charge from 8:00 to 8:45 a.m. School doors will be unlocked at 8:00 a.m. for morning club only. This is a club for students who would like extra homework or reading help. It is also available for parents who need to leave early for work and want a safe place for their students to be before school begins. Mr. Teuscher a certified teacher, will provide the morning club instruction. You must register your student for this club on the website. Winter Afterschool Session 2 will begin on Oct 29 and go through Dec. 13th. No Clubs will be held on Oct. 31 or Nov. 21, 22, 23 Monday clubs will be held 2:15-3:45, Tue.-Fri. clubs will be held 3:00-4:30. Tomorrow is our FUNdraiser. Looks like the weather will cooperate; the temperature is to be 59 degrees and sunny. How does this help Riverview Elementary? The Color Walk will raise money through sponsored pledges and laps walked. In other words, the students are actively earning money for our school! We are working towards purchasing chromebooks. How can I help? In addition to assisting your student(s) with pledges, you can sign up to volunteer or come and walk. Cheer on the kids on the day of the walk or participate with us on Tuesday, October 16th from 1:30 p.m. to 3:00 p.m. Mobile Chromebook carts: Currently each student in grades 4th – 6th has daily access to a Chromebook. This year we would like to purchase labs for each 3rd and 2nd grade classroom. Each lab is approximately $9,500; which includes 36 Chromebooks + 36 slot charging cart. What will students and teachers do if everyone has a device? With the help of 1:1, teachers are more able to differentiate instruction; using both face to face and online instruction. Thank you, PTA, for a great Red/Green Ribbon Week! Reflections Contest – Entries due Oct. 21st. The PTA presents the “Reflections” contest. Express yourself through art; Literature, Visual Arts, Dance, 3-D Art, and Photography. The 2018-2019 Theme: “Heroes Around Us.” Have students pick up an entry form from their teacher or at the office. The bookfair will be open each morning from 8:00-8:45 AM., during lunch, and after school. Calling all dads, grandpas, and uncles! Take a break from your usual morning routine and join us for doughnuts. We need your help to keep the school and your children safe. EVERY child’s safety is important to us. It remains our highest priority to ensure that students enter and exit cars in a safe and organized way. We ask everyone to correctly follow our pick-up and drop-off procedures. Failure to do so creates chaos, frustration and unsafe conditions. Each family should discuss these loading and walking procedures. Thank you for your continuing support in making Riverview a safe environment for all. Students can unload from PASSENGER SIDE of vehicle only. The driver should remain in the vehicle at all times and all driver side doors are to remain closed. Do not exit your vehicle and enter the building from the loading zone; please park in a stall if you are going to enter the building. October 16th – Assembly; Vocal Dimension, Chalk Walk from 1:30-3:00; SCC at 3:15 pm. 2018 Theme "Life is your journey, travel drug free." Monday: Red Rally Day. Wear as much RED as possible. Tuesday: "I have the POWER to be drug free. " Dress as your favorite super hero. Wednesday: "Don't let drugs get you mixed up." Wear crazy or mismatched clothes and crazy hair. Walk to school - the PTA will be passing out water bottles and sidewalk chalk for kids to draw with. Thursday: "Lei off drugs." Dress up in your favorite Hawaiian attire. Friday: "Team up against drugs." Wear your favorite team color, jersey or Riverview colors; "Too Smart to Start", students will be given bookmarks and Smarties. Red Ribbon Week Assembly at 9:00 AM. Why do kids complain when they have to run in PE , but can run around the neighborhood for three straight hours while wearing a refrigerator box on Halloween night? Why is it that kids can’t see that there are no periods or capitals in their four-page story but notice that I have something green in my teeth? Why do kids just stare at me and say nothing when they run into me in the grocery store? Why is it that no other job will bring as much enjoyment, frustration, excitement, sadness, contentment, worry, delight, sleepless nights, and joy as being a teacher? Friday is our FUNdraiser. We will have a ‘Chalk-Walk’ again. How can I help? In addition to assisting your student(s) with pledges, you can sign up to volunteer or come and walk. Cheer on the kids on the day of the walk or participate with us on Friday, October 5th from 1:30 p.m. to 3:00 p.m.
Back up date? In the case of inclement weather, we will hold the Chalk-Walk on Tuesday, October 16th. Riverview Elementary PTA presents the “Reflections” contest. Express yourself through art; Literature, Visual Arts, Dance, 3-D Art, and Photography. The 2018-20189 Theme: “Heroes Around Us.” Have students pick up an entry form from their teacher or at the office. Deadline: Monday, October 21st. We will be celebrating Red Ribbon Week October 8th – 12th. Red Ribbon Week serves as a vehicle for communities and individuals to take a stand for the hopes and dreams of our children through a commitment to drug prevention and education and a personal commitment to live drug free lives. Listed are some of the activities that we will be involved in. Wear as much RED as possible. October 5th – Spirit Day/Popcorn Friday & RIVERVIEW CHALK WALK!!!! !